I like the cell images with AO/PI dye. When a cell line didn’t have GFP protein just looking at the images I could tell that there was something wrong with it. I have compared it [Cellometer Auto 2000] with a hemacytometer and they are comparable while Vi-Cell was not. We have been counting PBMCs on a coulter counter, and once that broke, a manual hemocytometer. The Auto 2000 is faster, easier, and more effective than either method, to say nothing of the reduced hassle of cleaning a hemocytometer or constantly flushing and priming an aperture. The Auto 2000 is extremely useful for our laboratory. We use one a lot of times during our day. Cellometer helps do experiments much faster than before. This instrument is very helpful in our lab – we use it for AO/PI, trypan, and bright field staining for at least 5 different cell types and we are confident in the accuracy of the [Cellometer] Auto 2000. Ease of use is probably the most dominating feature [of the Cellometer Auto 2000]. Backed by a very supportive staff, using instruments or services through Nexcelom has been a pleasure. 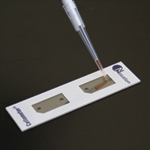 Pipette 20µl Insert Slide Select Assay & Click Count View Results in 30 seconds! The Auto 2000 utilizes bright field imaging and dual-fluorescence imaging to quickly and accurately identify and count individual cells. Cell count, concentration, diameter, and % viability are automatically calculated and reported. Dual-color fluorescence allows for staining of live and dead nucleated cells, generating accurate viability results even in the presence of debris, platelets, and red blood cells. Accurate analysis of both ‘messy’ and ‘clean’ samples enables the Auto 2000 to evaluate samples at a variety of points throughout sample processing – from initial collection to separation, to cryopreservation. 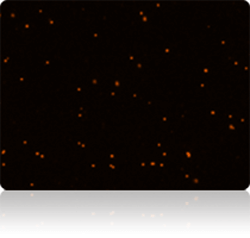 The dual-fluorescence AO/PI method utilizes nuclear staining dyes that bind to nucleic acids in the cell nucleus. Because most mature mammalian red blood cells do not contain nuclei, only live and dead mononuclear cells produce a fluorescent signal. There is no need to lyse red blood cells, saving time and eliminating an extra sample preparation step. Red blood cells, platelets, and debris are not counted in the fluorescent channels. These images (right) demonstrate the advantage of fluorescent counting for primary cells. The bright field image shows the combination of nucleated cells, red blood cells, and platelets present in the sample. 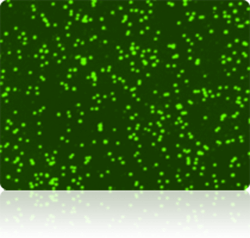 Only the live and dead nucleated cells are visualized and counted in the green and red fluorescent channels. Fresh human PBMCs (peripheral blood mononuclear cells) were spiked with varying amounts of RBCs (red blood cells.) All cells (nucleated + RBC) were counted in the bright field channel. Nucleated cells were then counted in the green fluorescent channel. Varying amounts of RBCs (1.8%, 4.6%, and 8.9%) did not affect the nucleated cell count. Several red blood cells are indicated in the bright field image (above, left). The red blood cells are not visible in the fluorescent image (above, right) detecting cells stained with nuclear staining dye. NCI-60 is a group of 59 human cancer cell lines (originally 60) developed by the National Cancer Institute for screening purposes. All 40 of the NCI Comprehensive Cancer Centers use Cellometer Cell Counters. The MCF-7 breast cancer cell line can be very clumpy. 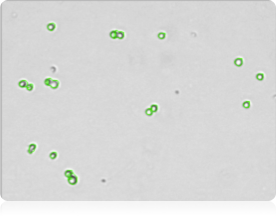 The Cellometer pattern-recognition software identifies and counts individual cells within these cell clumps for accurate analysis (shown above). The user-friendly touch screen displays pre-optimized assays for common cell types. User-specific protocols can be easily created and saved to the menu. The simple, pre-optimized assays make the instrument easy to operate and simplify training for new users. With the click of a button, researchers can select a new assay with saved counting parameters, making the instrument ideal for labs testing a variety of cell types. Auto-save options allow users to quickly test a series of samples. Because bright field cell counting does not differentiate nucleated from non-nucleated cells and trypan blue staining is not as easy to detect as fluorescent staining, dual-color fluorescence is strongly recommended for accurate viability analysis for primary cells. The Auto 2000 is equipped with standard assays for dual-fluorescence analysis of primary cells stained with AO/PI. Acridine Orange, AO, is a nuclear staining (nucleic acid binding) dye permeable to both live and dead cells. It stains all nucleated cells to generate green fluorescence. Propidium iodide, PI, can only enter dead cells with compromised membranes. It stains all dead nucleated cells to generate red fluorescence. Cells stained with both AO and PI fluoresce red due to quenching, so all live nucleated cells fluoresce green and all dead nucleated cells fluoresce red. No two cells are the same. With the Auto 2000 Cell Counter, cell morphology can be immediately viewed on-screen in the bright field image. Counted cells are indicated on-screen for further verification that cells in the sample are being imaged and analyzed properly. Bright field counted images can be viewed for basic cell counting and trypan blue viability. Fluorescent counted images indicating counted live and dead nucleated cells can be viewed for dual-fluorescence primary cell viability assays. The bright field image confirms that individual cells within pairs are being counted and smaller debris is not being counted. 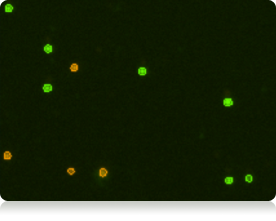 In the combined fluorescent counted image, live counted cells are circled in green. Dead counted cells are circled in red. The Auto 2000 Cell Counter Automatically generates a cell size histogram based on cell diameter. Counting 1 x 106 cells takes approximately 5 minutes with a manual hemacytometer. Counting live and dead cells sometimes takes twice as long. The Cellometer Auto 2000 Cell Viability Counter calculates cell count and concentration for live and dead cells and % viability in just 30 seconds. The Cellometer Auto 2000 offers excellent reproducibility, with a %CV (Coefficient of Variation) of <10% for fluorescent concentration and viability measurements. The data (below) is based on four preparations of Jurkat cells stained with propidium iodide, a fluorescent nuclear-staining dye. Cellometer Disposable Imaging Chambers consist of two independent enclosed chambers with a precisely controlled height. Cell suspension of 20 microliters is loaded into the chamber using a standard single channel pipette. The chamber is inserted into the Cellometer cell counter and the cells are imaged. This simple sample loading and analysis method is ideal for fragile cells. The Auto 2000 allows users to generate specific folders to which data reports and images can be auto-saved. Using the auto-save feature ensures all data is accurately captured in the correct location. It also enables users to test a series of samples very quickly. Users can configure the Auto 2000 to request a new sample name for each sample that is imaged and counted or apply auto-numbering to individual samples in a series to further reduce analysis time. Users can also apply a time stamp to individual data files. All Nexcelom Applications Specialists are 100% focused on image-based cell concentration & viability and cell-based assays using Cellometer Image Cytometry. The results indicate the accuracy of the Cellometer Auto 2000 instrument in assessing the viability of Jurkat cells using AO/PI for cell viability. Four measurements were performed for each sample. The viability average was calculated and plotted. The results show the reliability and accuracy of the Cellometer Auto 2000 in measuring cell concentration and viability of mammalian cells. 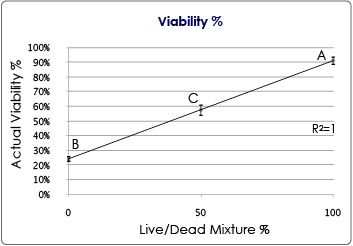 Figure 2: Chart of the % viable cells at 3 different live/dead mixture ratios. N=4 per measurement. The error bars correspond to the standard deviation for each measurement. 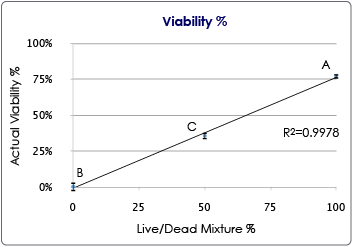 Figure 1: Table of results for AO/PI viability using the Cellometer Auto 2000. The results indicate the accuracy of the Cellometer Auto 2000 instrument in assessing the viability of Jurkat cells using PI for cell viability. Four measurements were performed for each sample. The viability average was calculated and plotted. The results show the reliability and accuracy of the Cellometer Auto 2000 in measuring cell concentration and viability of mammalian cells. Figure 1: Table of results for cell viability using PI only. The results indicate the accuracy of the Cellometer Auto 2000 instrument cell concentration. Serial dilutions (2-, 4-, and 8-fold) were prepared using PBS and Jurkat cells. Four measurements were performed for each sample and the averages were calculated and plotted. A linear correlation between the concentration measurements and 1/dilution factor was observed. The results show the reliability and accuracy of the Cellometer Auto 2000 in measuring cell concentration. Figure 2: Jurkat cell concentrations at various sample dilution factors. N=4. Error bars correspond to the Standard Deviations for cell concentration. Figure 1: Table of results for total cell concentration for the Cellometer Auto 2000 instrument. The results indicate the accuracy of the Cellometer Auto 2000 instrument when counting Jurkat cells at very low concentrations (between 5-7E+04 cells/ml). AO was used to measure the concentration of cells in the F1 channel. Results from 4 measurements were plotted. The CV values are very close, which indicates the consistency of the measurements. The results show the reliability and accuracy of the Cellometer Auto 2000 in measuring at low cell concentration. 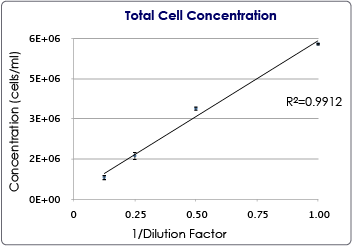 Figure 2: Graph of Concentration for 4 different measurements using the Low Concentration of Cells Assay and AO on the Cellometer Auto 2000. 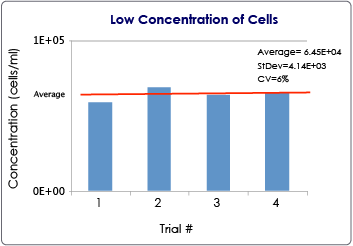 Figure 1: Table of results from the Low Concentration of Cells assay. Cellometer Auto 2000 has no liquid handling fluidics system. Therefore, cleaning related maintenance is eliminated completely. Optical light sources in Auto2000 are light emitting diodes, with standard lifetime of more than 10,000 hours. Therefore minimum maintenance is required for optics either. Some customers purchase yearly preventative maintenance contract from Nexcelom. We also offer extended warranty. Costs of the services vary. Conc. Range: 105 – 107 cells/mlBright field imaging, fluorescent imaging and pattern-recognition software to quickly and accurately decluster, identify and count individual cells. We absolutely love the Cellometer Auto 2000! The counting is consistent, the purity check that it does for us is amazing. Thank you Nexcelom for making cell counting easier, for scientists/researchers everywhere! The Cellometer Auto 2000 is a great counter! It is designed for simple, accurate analysis of nucleated cells, including PBMCS, splenocytes, and stem cells, in peripheral blood, cord blood, bone marrow and other heterogeneous samples. The Cellometer Auto 2000 is pretty straightforward in terms of its use. It has saved a lot of time from counting cells with hemacytometer. It doesn’t take much space either! The Cellometer Auto 2000 is great for counting AML cells. The cell count is more accurate than Trypan Blue and gives a count for live and dead cells. It has really helped increase consistency in my experiments! The Cellometer Auto 2000 offers us several quick and easy ways to compare count and viability to more manual methods and other automated methods! The Cellometer Auto 2000 saves us so much time in daily lab work by eliminating manual cell counts after each passage or thawing. The results are both accurate and reproducible. We use it every single day in our lab! I like the Cellometer Auto 2000 cell counter! It makes it very simple to count primary cells. I have used this counter over the last 7 years, so I can’t imagine any other counters replacing this! The Nexcelom Cellometer Auto 2000 has been a great tool in determining cell count and viability. When doing cell culture of primary cells it is important to know what you’re dealing with in a timely manner so you can plate the appropriate cell density. The Auto 2000 is a good tool for making this process fast, efficient and accurate. It is a vast improvement over using Trypan Blue and gives results that we can trust! The Cellometer Auto 2000 is very easy to operate and really helpful for us to count cells! It looks very nice and is not very thick for handling. The two-sided film slides are my favorite, because I don’t need to worry about the contamination of hands or my bench! The Cellometer Auto 2000 has allowed me to streamline a great deal of my work on cancer drug screening by providing a fast, accurate way to quantity cells with its fluorescent viability platform for cytotoxicity assays. We have been using the Cellometer Auto 2000 here in our lab for over a year and it has been such a great addition to the lab. Out lab processes PBMCs, counts them and then places them into a 2 week in-vitro stimulation culture in the presence of peptide pools. Two weeks later we harvest the cells, count them and then run them in both an Elispot and a Cytokine stimulation assays. The use of the Auto 2000 cell counter has made the counting of cells much easier in much less time. – Natalia Jun, Human Longevity, Inc. The Cellometer Auto 2000 works well for us! We use the Cellometer Auto 2000 routinely for cell death and cell viability assays with AOPI. The Cellometer Auto 2000 is easy to use and provides accurate counting. Everyone in the lab loves it! It is a great product overall! 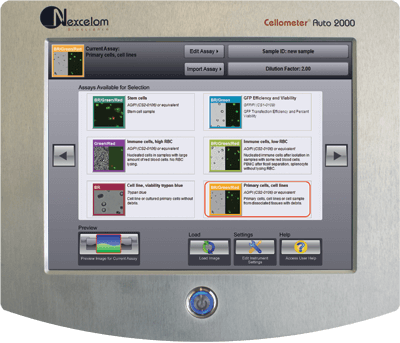 My favorite aspect of the Cellometer Auto 2000 from Nexcelom is the ability to view the cells and count them. You can tell right away how your cell density is and if the cell suspension needs to be diluted. With the Cellometer Auto 2000 it is so easy to count cells! And it uses far less sample than the Nucleocounter without needing to dilute sample! The Cellometer Auto 2000 is easy to operate and has eliminated the excess time spent on manually counting cell numbers for the large volume of patient samples we receive in the lab. It provides improved counting accuracy and viability information on cells counted and also gives us the ability to refer back to previously counted cell samples as needed. I’ve been using the Cellometer Auto 2000 with the AOPI premade dye Nexcelom manufactures for the past year. It has been great for my lab group, we would be lost without it! The Cellometer Auto 2000 is fast and easy to use system. Only 20 uL of cells are needed for each count, which is essential for some precious samples like primary cells. The Cellometer Auto 2000 requires only a small sample volume and counts cells accurately in a really short time. It allows counting of multiple cell samples and is easy to use for a lot of different cell types. The Cellometer Auto 2000 is easy to use. Just choose programs for your cells and focus. It is much faster and accurate than hemacytometer! I use the Cellometer Auto 2000 in all my experiments! It works like a champ! It saves me so much time. Our entire department loves this Cellometer! The Cellometer Auto 2000 is very convenient machine, the resolution is great for the cell count. Live and dead cells can be distinguished very clearly. The Cellometer Auto 2000 is very reliable, easy to use, and has saved a significant amount of time while providing accurate cell counts! The Cellometer Auto 2000 is amazingly fast and effective! It has saved me lots of time compared to counting cells using hemacytometer. I would recommend this Cellometer to all my friends and colleagues in other labs! The Cellometer Auto 2000 is compact, easy to handle and the software is user friendly! It saves us a lot of time compared to counting on the microscope. The Cellometer Auto 2000 from Nexcelom is very robust and useful for counting PBMCs. I have used Cedex and Vi-Cell in the past, which took a lot of time while waiting for samples to be counted. With the Auto 2000, my cells don’t need to sit in a tube while waiting for cell count results! We love the Cellometer Auto 2000! It is very effective, convenient and saves my time! It is very easy to use with the touch screen! We have been using the Cellometer Auto 2000 to count splenocyte samples without RBC lysis. The Cellometer Auto 2000 and the AOPI Viastain gives us the ability to get an accurate count of our live splenocytes while excluding the red blood cells. The Cellometer Auto 2000 has changed the way we count cells. It saves time and takes away worries about inaccuracy! We can do a lot more in a day because of this machine. The Cellometer Auto 2000 has a beautiful interface that is easy to use. We process whole blood, and our viability counts have gone up now that the RBCs are excluded. The Cellometer Auto 2000 is very reliable and easy to use! Counting cells is much simpler with this instrument! The Cellometer Auto 2000 makes it easier to get an accurate count on my cells compared to flow cytometry. I am comfortable with it and trust the data that I obtain! The Cellometer Auto 2000 has changed the way my lab works! It is a streamlined workflow and is extremely user friendly! Our Cellometer Auto 2000 has increased the speed and ease of cell counting. Using it with the AOPI dye has made our cell count and viability measurements much more consistent and accurate than Trypan Blue for morphologically varied tissue homogenates (e.g. mouse small intestines). The Cellometer Auto 2000 saves so much time! Experimental data is a lot more reliable when using the Cellometer Auto 2000 than trying to count lavage cells from 20 different samples on hemacytometer. The Cellometer Auto 2000 has greatly increased our productivity for in vitro experiments. The automated counting saves hours of time each week compared to manual counting with a hemacytometer! Also being able to quickly access viability of cells is great! The Cellometer Auto 2000 works well, and it has helped speed up the cell counting process compared to manually counting. The Cellometer Auto 2000 has made functional testing of T cells a much quicker and simpler process than before! When the cell concentration of each population in a 96 well plate must be determined, it is hard to imagine having to count the cells by hand and doing this in a timely manner. Great product! I like working with the Cellometer Auto 2000 because I can get quick, consistent results! Before the Auto 2000, our lab was manually counting cells with a hemacytometer. Manual counting can be time-consuming and inconsistent. As a result of this time-saving equipment, we can focus more of our time and energy on what matters most – our research! I like the Cellometer Auto 2000 in general, I like the accuracy and the ability to use it for different cell types! I use the AOPI viability dye with the Cellometer Auto 2000 to count primary murine and human cells, as well as cell lines. The cell counts are more accurate than traditional Typan Blue method. We are addicted to using the Cellometer Auto 2000 over grid counting cells. The instant calculation of dilutions, cell diameter, cell viability and a count in each population has helped us tremendously. The ability to use AOPI dyes in cell counting has greatly increased our ability to count potentially difficult cell populations, such as PBMCs. When the separation has a higher amount of debris present, I feel that I am able to get a more accurate count using this machine, rather than just with Trypan Blue stains! The Cellometer Auto 2000 has been a huge help to our lab! Before purchasing, we used to count on the old fashioned glass hemacytometer, always with some variability. Now, all that we do is mix our cells with the AOPI, put them on the slide, and count. It has been great help! With the Cellometer Auto 2000, our cell viability assay take about 25% of the time it used to take using flow cytometry! The lab I am in uses the Cellometer Auto 2000. It is so much faster than manually counting cells, and the count is every bit as accurate. It is extrememly easy to use and saves everyone in the lab a lot of time! We use our Cellometer Auto 2000 daily for our cell culture counting and viability assays. It’s very easy to use, with user-friendly software, quick and accurate cell counting, proper record keeping, and cheap maintenance. It’s a small treasure for our GMP lab and I highly recommend it! We just recently purchased the Cellometer Auto 2000 system and routinely use it for mesenchymal stem cell count and viability. I like that it’s fully automated, and all the analysis takes less than a minute! It’s more accurate than to manually count with a hemacytometer. The speed and simplicity of the Cellometer Auto 2000 is great. Such a time-saver over the old-fashioned hemacytometer. Easier and less messy to use than the Beckman Vi-Cell. The Cellometer Auto 2000 is a great cytometer! It works well counting PBMCs isolated from human blood. We tested the counts in comparison to our old cytometer and by counts made by eye, and the numbers were accurate and reliable! Our Cellometer Auto 2000 has been a staple in multiple of our projects. We use it on a daily basis and have been very happy with its performance. It is reliable and a huge time saver! The Cellometer Auto 2000 is very reliable in operation. It responds quickly between functions and usages without rebooting. It has great consistency between different functions/modes in cell counting. Thanks to the Cellometer Auto 2000, I can do my flow cytometry and HSC transplantation faster and better, while giving a very repeatable reading! Our Cellometer Auto 2000 has greatly improved the speed and accuracy of our cell counting and has allowed us to analyze our cell samples in a variety of ways. The AOPI feature has been integral in generating cell viable data for a few of our new projects. The customer service team is also amazing! They are very knowledgeable about their products and technology and are always available to help us troubleshoot. The Cellometer Auto 2000 is a very efficeint way to quickly count cells. We have been using it for every cell culture experiment and pass, making that step of the process pretty seamless. The Cellometer Auto 2000 system has greatly simplified the way my company does cell counting and has become a very essential piece of equipment. We use it for both high and low RBC cell counting for viability purposes to accurately culture large volumes of cells. It has cut down on the amount of time we take to do cell counts and allows us to complete our processes in a very timely fashion. Truly a great product! – Derek Grice, Cognate BioServices, Inc.
We purchased a Cellometer Auto 2000 cell viability counter. It is great for cell counting and viability recordings. The touch screen feature and cell imaging features are great. Our lab bought a Cellometer Auto 2000. We regularly grow primary human T cells, and with a lot of samples per experiment (20-30+), it has been a lot of work to keep track of growth/expansion and viability prior to having the Cellometer. With the Auto 2000, it is much easier, and much more reliable to count each set of samples and get reliable data on expansion and viability, and we are able to take samples for counts every other day, rather than once a week. I have used the Cellometer Auto 2000 in my previous lab extensively for counting mouse primary cells. I cannot be thankful enough to you guys for making such a great product. I liked it so much that I convinced my boss at my new lab to buy the Cellometer Auto 2000 in spite of already having a cell counter from different company. I like my Cellometer Auto 2000 because it saves my images that I may go back and review. I also like the histogram and the ability to export to Excel. We have the Cellometer Auto 2000. This instrument has streamlined our experiments. We have several animal studies that require various cell counts. Given that these studies take place over several months, the Cellometer has given us a mode by which to keep out counts consistent (as opposed to manual counting, which would require the same person to count over the course of experiments and is relatively subjective anyhow). We love how quickly we can obtain our data and feel confident that the instrument is giving us accurate results. It’s also convenient that the Cellometer works with a variety of dyes (AO/PI, Trypan Blue, etc. ).